Finding all the best travel deals! I spend it with my family in Limburg. Want to see for yourself? Click here! Today I will review one of my travel secrets: Ticketspy. I asked her how she did it. She forwarded me the site and I could not believe my eyes. We booked the same week! 500 euros for a two way ticket from Amsterdam to Miami! WITH A RENTAL CAR! FOR TWO WEEKS!! Before I saw the site I didn't believe it was possible to travel on a student budget to exotic locations. We later found out that two of our friends actually booked the same trip, during the same period, with the same travel company and actually sat two rows behind us in the plane! What a small world.. Since 2015 Ticketspy has opened a lot of doors for us. Because of the low prices we were able to travel a lot more than ever before! In 2015 we went to America for the first time ever! This has always been a dream of mine and to see it become a reality was amazing! In 2016 we went to the Dominican Republic, where we both got hospitalized. But that is a story for another time! And finally, in 2017 we booked a ticket to Hawaii for 350 euros both ways! To allow ourselfs to save up some money we decided to fly in february 2018 (yes.. only 30 days left to go!). Uhm, is this for real? So how does this work I hear you ask. 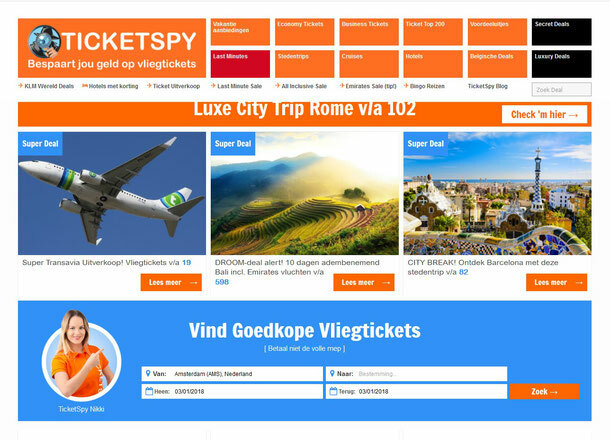 Ticketspy searches continually for low airfares and package deals with different travel agencies and airlines. They also look for Error fares, which are fares that are possible due to a human error (like a typo) when uploading the offer to their site. When you go to the website the easiest thing to do is to check out their landing page. Here you will find the newest offers. If you want to search more directly for holiday packages you can check out this link. If you're however only looking for cheap economy tickets you need to click here. And if you have a wee bit larger budget you can find the business tickets here. When you find a deal you love, you click on the picture and then click on the button saying 'bekijk de stoelen' which is Dutch for see the (plane)chairs. You will be redirected directly to the travel agent or airline. Piece of Cake! Next week a post about weflycheap. I just booked my first trip here thanks to your post.